Oil on Canvas, 16" x 13" 16" x 24"
"Aspens Hondo Canyon" "Our Garden"
"Cottonwoods, Cedar and Sage-Taos Canyon"
Oil on board, 10" x 14" 10"x14"
"Indians in Aspen Forest Twining"
Oil on canvasboard, 8.6" x 6.3"
Oil on canvas, 24" x 17"
"Afternoon Clouds" "Still life with Japanese doll, vase and fish"
"Taos Winter" "Autumn in Taos"
Oil on canvas, 20" x 24" Oil on canvas, 20.5" x 24.5"
"Apple Blossoms" "Moonlight and Firelight, Crow Reservation, MT"
"Taos Mountain" "Stray Horse Gulch"
"Sand Verbena- The Desert at Palm Springs" "Back Yard Talk"
Oil on canvas, 16" x 20" Oil, 8" x 6"
"Looking to the Sun" "Coccino Pines"
Oil on canvasboard, 9.75" x 13.75"
not as empheral fiction has delighted to picture him, but as a human being, endowed with intelligence, swayed by nobility of thought…"
. . . It was the romance of youth, of boyhood, I suppose. Then when I came to know them I liked them for themselves. 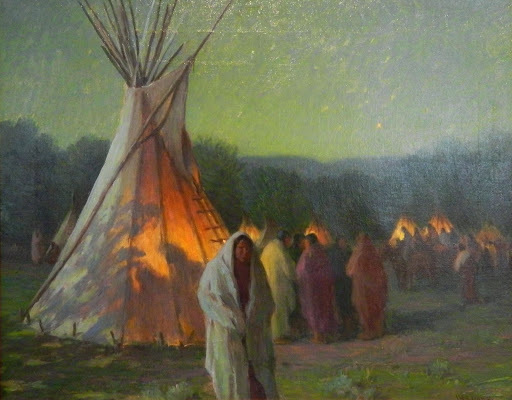 Perhaps they attracted me as subjects to paint because of their important historical value as the first Americans. Then the color of their costumes and dances, this no less attracted me." "If I don't paint them [the Native Indian Americans] no one ever will." J.H. 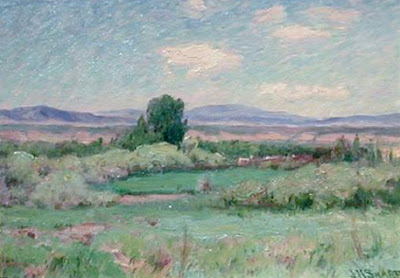 Sharp was the first of the Taos Society of Artists to visit Taos, coming in 1893. 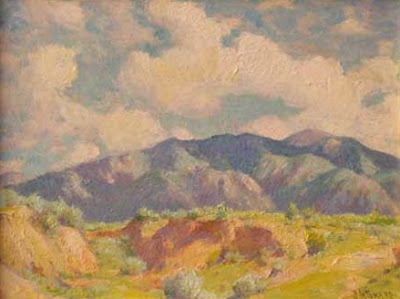 This early trip became a pivotal moment in the future of Taos, as Sharp's Paris description of the exotic New Mexican village to fellow Academie Julian students, Ernest Blumenschein and Bert Phillips, would influence their decision to visit Taos and lead to the founding of Taos as an art colony. 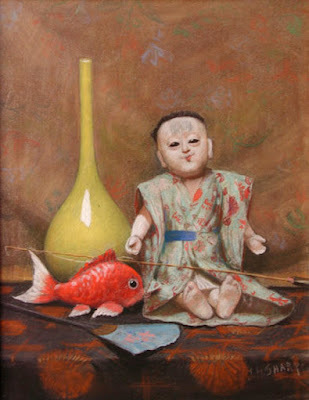 Born in Bridgeport, Ohio, Sharp was interested in art from an early age. 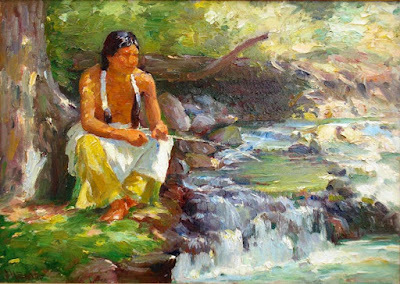 After gradually losing his hearing from a swimming accident, traditional schooling became increasingly difficult, and at fourteen he moved to his aunt's house in Cincinnati, OH, to work while enrolling part-time in art classes at Mickmicken School of Design and the Cincinnati Art Academy. His father's unexpected death when Joseph was just twelve had also precipitated the move, and the youth sent most of his earnings back to his mother. 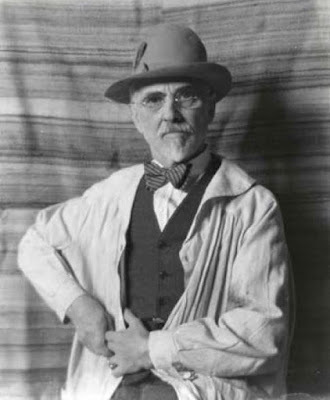 Following his education in Europe, Sharp returned to Ohio where he took a teaching position at the Cincinnati Art Academy and established himself as a prominent portraitist. 1883 marked Sharp's first trip to New Mexico and the American Southwest, although he did not visit Taos. 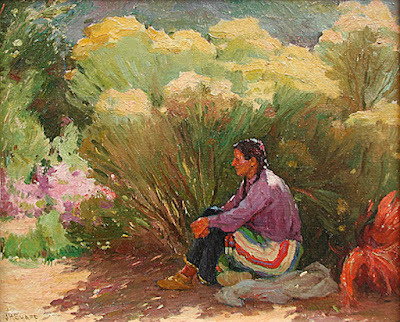 Later, in 1893, he received a commission from Harper's Weekly to paint life within the Taos Pueblo, and his work was very well received. Sharp befriended E.I. 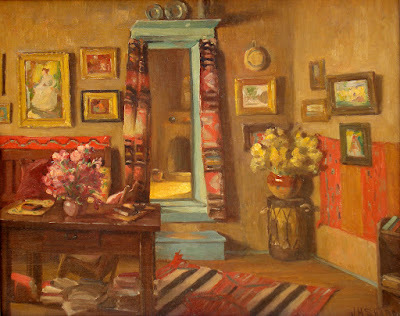 Couse in Paris, who was similarly affected by the young artist's tales and pictures of a fascinating land. He studied under Benjamin-Constant and Jules-Joseph Lefebvre. 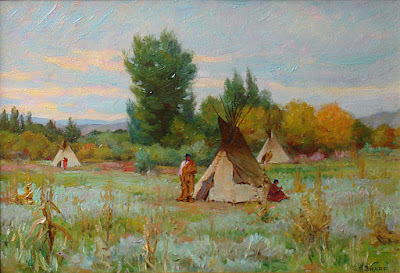 Upon his return to the States, Sharp continued his teaching, worked as an illustrator, and spent time in Montana painting the Plains Indians. 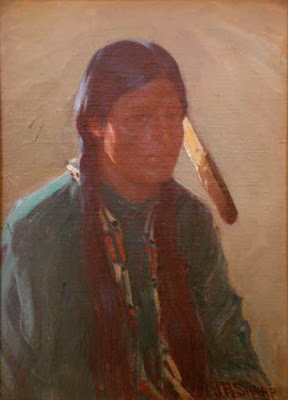 1900 marked a critical year for Sharp's career, as some of these Plains Indians portraits were exhibited in Paris and Washington, D.C., gaining the attention of Theodore Roosevelt. 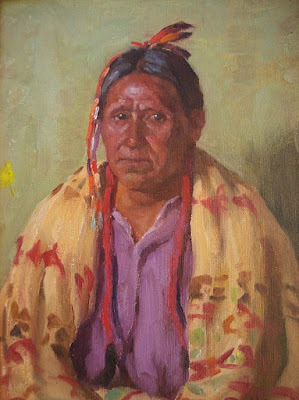 Roosevelt soon commissioned the artist to paint some 200 portraits of the survivors of the Battle of Little Bighorn, and Sharp and his wife settled in a studio / cabin at a river juncture near the famous battle site. 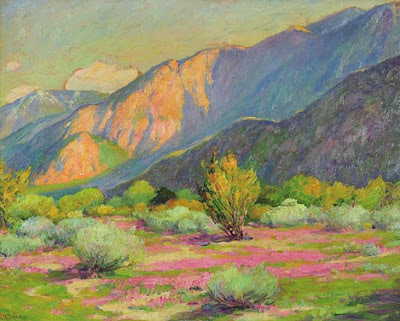 Just two years into his Plains painting venture, Phoebe Hearst (mother of William Randolph Hearst) bought 80 works, giving the artist financial independence and the ability to paint full-time. 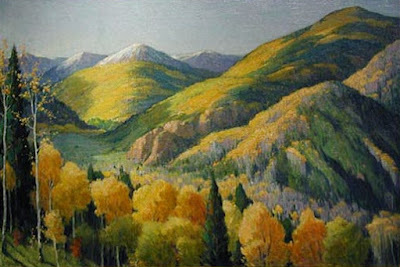 New Mexico continued to seduce Sharp, and he and his wife spent some of their summers in the familiar mountainous desert. 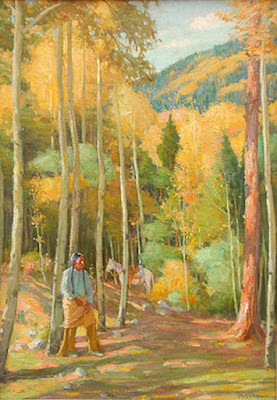 By 1912 the lure of the land was too great, and the couple relocated to Taos permanently. 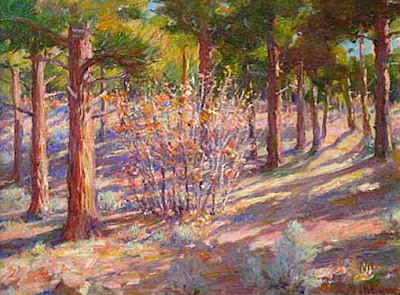 That same year Sharp also became a charter member of the Taos Society of Artists, where he was known for his patience, wit, and spiritual depth. 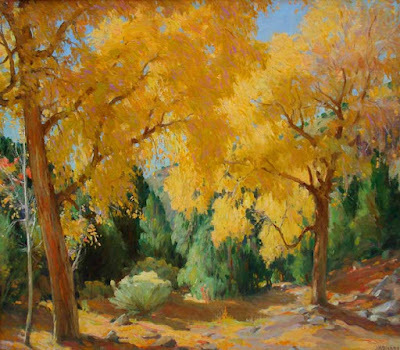 By all accounts, Sharp had achieved great success during his illustrious career, and continued to paint and travel the world well into his 80s. 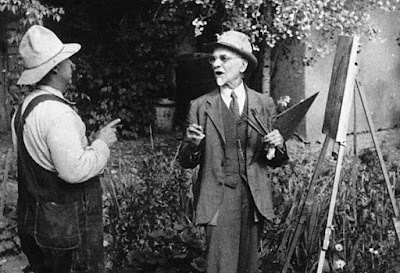 Just four years before his death, the Gilcrease Museum in Tulsa, OK, honored Sharp with an exhibition of his work in 1949, a celebration of a man whose artistic acuity and drive for preservation should long be remembered. 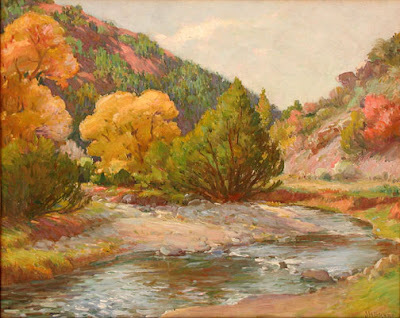 The subjects of Joseph Henry Sharp art works included the human figure, portraits, Human head images, faces, portrait heads, Human Activity, Indian Figure Prior to 1940, Native Americans, North American Pioneers, Beach Scenes, Bathers, Swimming, American Indians, Cowboys, Pioneers, Horses, mammals, animals, Barnyard Fowl, Chickens, Roosters, Still Lifes, Floral Landscapes and Wildflowers, Seascapes, skyscapes, Coastal and Shoreline Views, Gardens and Garden Scenes, Historical Figures, Sites and Events, Floral Still Lifes, Floral Motifs and Flowers, Landscapes, Riverfronts, Boats and Canoes, Snow scenes, Winter scapes and national and state parks. 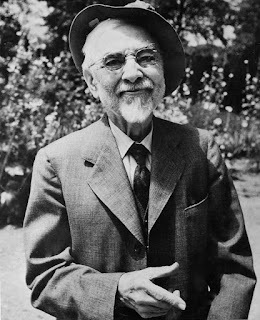 Some of the places he lived and worked include Paris before 1900, the Pacific Northwest Before 1900, Southern California Before 1900, Missouri River Valley Before 1900, Minnesota and Upper Mississippi Before 1900, Italy Before World War I, California Before 1940, Taos and New Mexico Before 1940, Arizona Before 1945, Europe, Glacier National Park, Grand Canyon, Arizona, Hawaiian Islands and South Seas and Tahiti. Joseph Henry Sharps' teachers include Benjamin Jean-Joseph Constant and Jean Paul Laurens. Parsons does not offer Joseph Henry Sharp prints, because no print can compare to the real paintings. 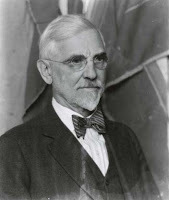 JH Sharp was born in Bridgeport, Ohio on Sept. 27, 1859. His interest in Indian Culture began as a youth. A boyhood swimming accident and near drowning left him with gradual progressive deafness. 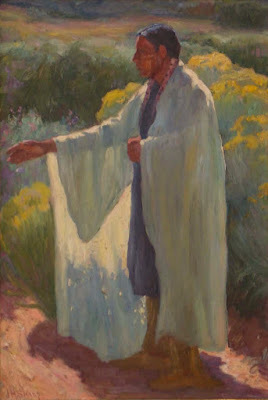 In 1873 he studied at the McMicken School and then the Cincinnati Academy of Art. There he met Henry Farny who showed him books about Indian culture. 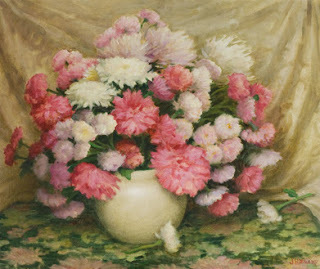 In 1882 Sharp attended the Antwerp Academy studying under Charles Verlat. Sharp moved back to Ohio, accepting a teaching position at the Cincinnati Art Academy. 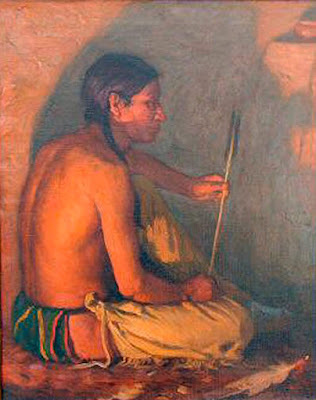 In 1883 at age 24 he traveled to Santa Fe, New Mexico, Arizona, California and Wyoming sketching the Indians and Pueblos. 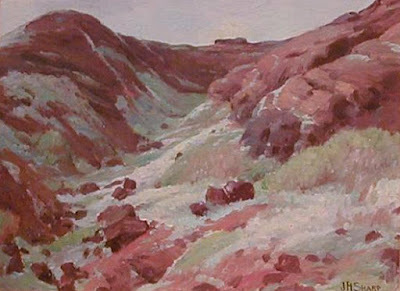 In 1886 he returned to Europe to study at the Academy in Munich under Karl Von Marr. In the 1890s he was a student at the Académie Julian in Paris studying with Jean Paul Laurens and Benjamin Constant in Paris. In 1892 Sharp moved back to Cincinnati in 1892 and married Addie. 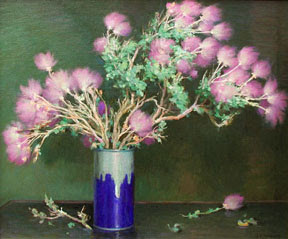 He taught at the Art Academy of Cincinnati. 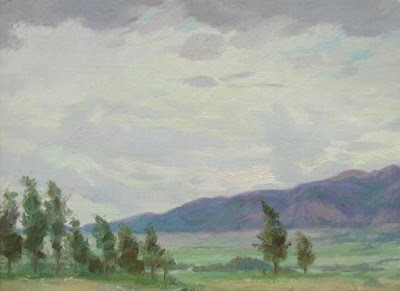 In 1893, Shape, along with John Hauser traveled west to sketch, making his first visit to Taos. 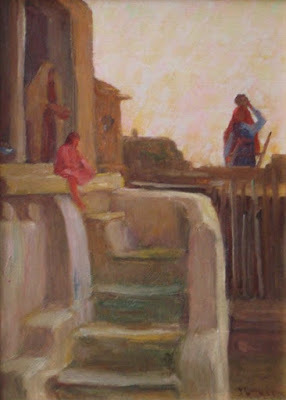 His sketches of Taos Pueblo were published in Harper's Weekly. In 1885 he traveled to Europe with John Hauser. 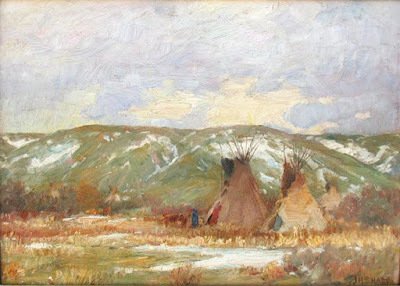 In 1899 he went to Montana, camped at the battlefield of Little Big Horn and sketched the Sioux and Crow Indian warriors. 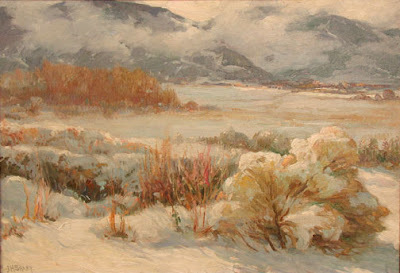 In the 1890s, he studied with Frank Duveneck in Italy. iIn 1900 Theodore Roosevelt discovered Shapes works. He arraigned commissions for the artist. 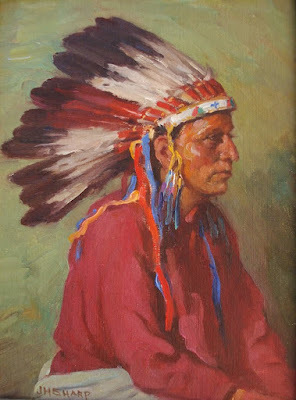 In 1901 Sharp built a studio in Montana and worked to "make a visual record of Indians who had fought against Custer." 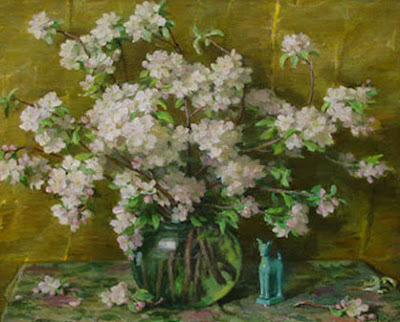 From 1892 to 1902 he taught at the Cincinnati Art Academy. In 1905 Sharp and his wife Addie constructed a cabin - called Absarokee Hut. 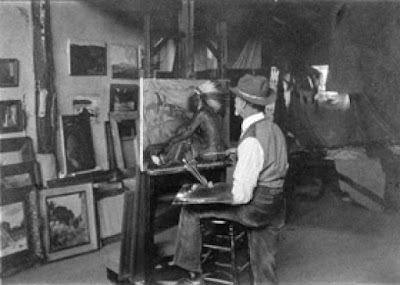 In 1909 Sharpe purchased a studio in Taos, near to the EI Couse Studio, which previously served as an old Penitente chapel. Near the Studio, he built a two story house. and is on the National Register of Historic Places and the New Mexico Register of Cultural Properties. 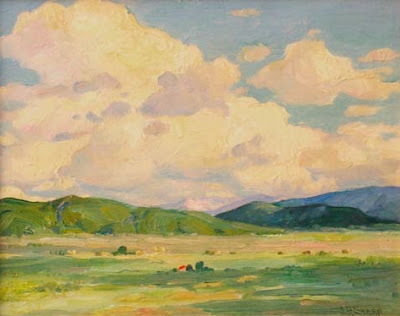 In 1912 he and Addie moved to Taos permanently. 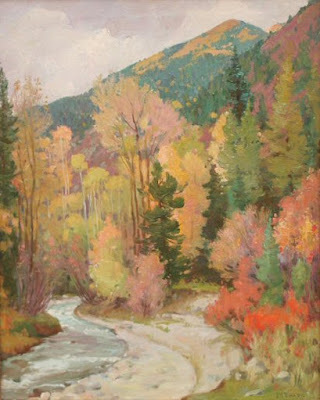 In 1915 he was a founder of the Taos Society of Artists. In the 1920s he bought a winter home in Pasadena, California. 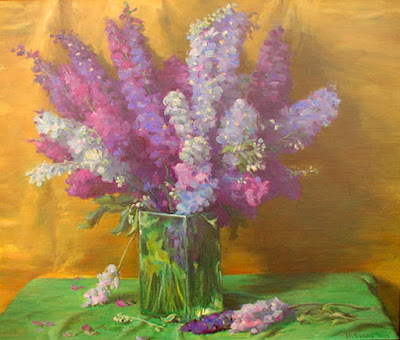 From there he created landscapes and floral compositions. 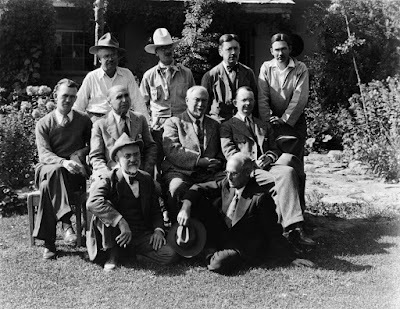 In 1927 the Taos Society of Artists disbanded. In the 1930s he traveled to and vacationed in Hawaii, with his second wife, Louise. 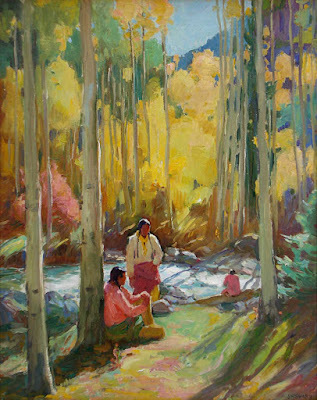 In 1949 Shape was honored with an exhibition of his work by the Gilcrease Museum in Tulsa, OK.
Sharpe closed his Taos Studio at age 93. He died in Pasadena, California on Aug. 29, 1953. 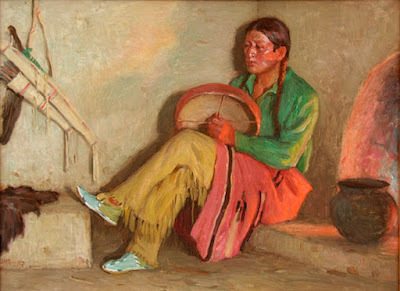 Joseph Henry Sharp usually signed his name JHSharp, but sometimes added "TAOS"
Sharp said, "If I don't paint them [the Native Indian Americans] no one ever will."